If login fails, the device may need to be reset (see Related Topics). For assistance, refer to Related Topics. From Settings, click Change Admin Password. Enter a password into the following fields. Default password: LteFemt0 (zero at end) and is case sensitive. Click Password Rules to view the password guidelines. 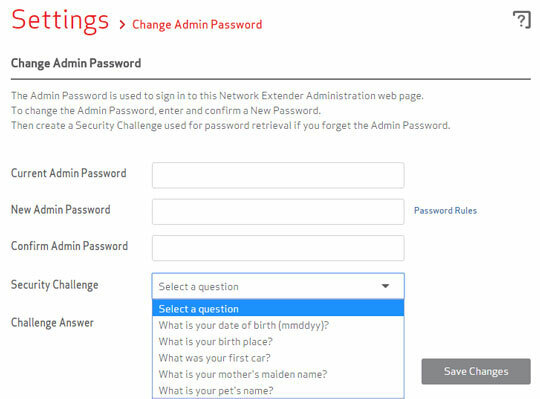 From the Security Challenge dropdown menu, select a security question. Enter the Challenge Answer then click Save Changes. If prompted, verify the password conforms to the password guidelines displayed then click OK.